Chrome Oxide or Chromium Oxide is a very refractory ceramic colorant (even a 50% mix with a high borax frit will not even begin to melt it in a crucible). 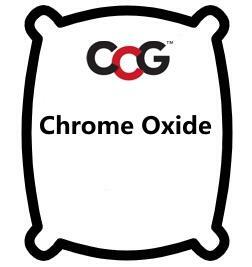 Chrome oxide is the only stable oxide of the metal chromium. It is a bright to dark green crystalline powder insoluble in alkalis and acids. It is manufactured from the mineral Chromite mined in southern Africa, Asia, Turkey and Cuba. As with other powerful colouring agents, chrome must be milled fine enough to eliminate specking in glass or glaze. Chromium is a 'fast' colorant, meaning can produce strong green colours under all furnace conditions, slow or fast, reducing or oxidizing. It is also a flat colorant (due to its refractory nature), it usually produces an army helmet opaque green. It is powerful, typically only 2% will produce a dark colour. It cannot be used to make a metallic glaze. Chrome oxide is usually employed in raw glazes whereas potassium dichromate is used in fritted glazes. Since Cr2O3 becomes 2CrO3, oxygen is captured from the surroundings, thus the percentage (or conversion factor) is greater than 100.